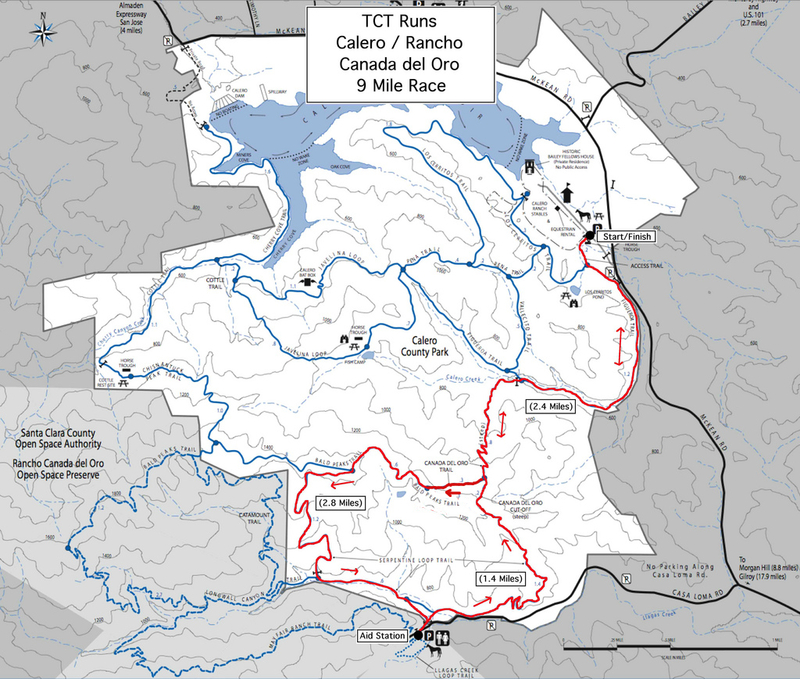 Beginning at Calero County Park, this trail run has everything! Experience awesome single track, great hills, and dirt paths. The 50K is a challenging, fantastic trainer for Western States that includes oak trees, exposure, good heat training, and panoramic vistas. 200 runner limit. 9 hour time limit. Race day registration is available beginning at 7:00 AM. Please add $10.00 to the above fees. You will stay inside Calero Park. You will run a Clockwise loop. Follow the Green Ribbons. Follow 5K signs and gypsum arrows. You will stay inside Calero Park. You first run the 5K course in a clockwise direction loop then return to the finish/aid station then reverse the 5K course. Just run counterclockwise to complete the 10K course returning to the finish. Follow the GreenRibbons. Follow 5K signs and gypsum arrows. Start out following Orange Ribbons to the first aid station. After arriving at the aid station, turn around following Pink Ribbons to the finish. Run 3.8 miles following Orange Ribbons to the first aid station located at Rancho Cañada del Oro parking lot. After reaching the first aid station, continue running west now following Blue Ribbons running a 4 mile clockwise loop returning to the aid station. After returning to the aid station for the second time, the 13.1 milers turn around following the Pink Ribbons to the finish. 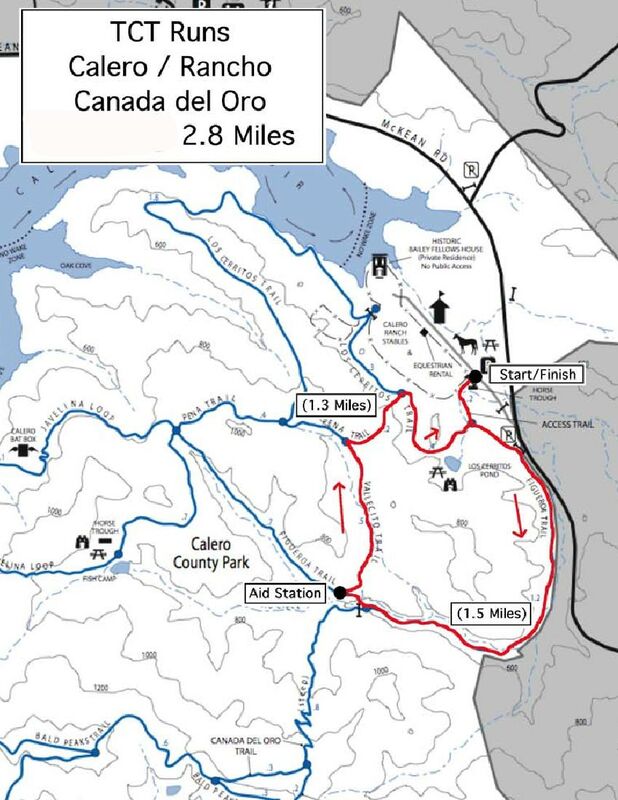 Troy will be located at the Rancho Cañada del Oro aid station directing to insure you stay on course. 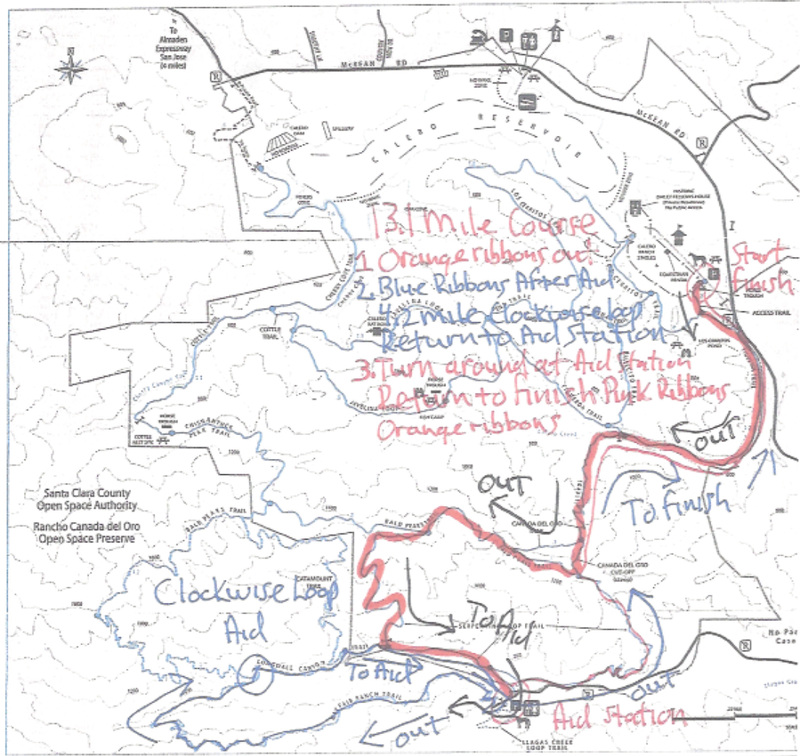 50K runners can use the 16 mile course map as reference. These 2 distances will first run the Half Marathon in its entirety and return to the finish line. Then the 25K and 50K runners will go back out and run the 5K course (Green Ribbons) running a clockwise loop and return to the finish. 25K runners are done. 50K runners go back out and run the 16 mile course (Pink Ribbons) leading over to the Rancho Cañada del Oro aid station parking lot. Then they reverse, running a counterclockwise loop (Blue Ribbons), the 4.2 mile loop previously ran when doing the Half Marathon course. The 50K runners return to the Rancho Cañada del Oro aid station then follow Orange Ribbons back to the finish line. 50K runners then go back out and run the 10K course (Green Ribbons) now running a counterclockwise loop and return to the finish for the last time. Parking: Carpooling is encouraged. Park at Calero Parking Lot on McKean Road. Please drive the speed limit and be respectful of the people living on Casa Loma Road. Please check the course maps to follow your runner. Crews may follow their runners by driving to Rancho Cañada del Oro Aid Station located at Rancho Cañada del Oro’s parking lot. Turn right onto McKean Rd. Drive approximately one mile on McKean Rd. Drive approximately one mile on Casa Loma Road. Rancho Cañada del Oro parking lot will be on your left. The Aid Station is located next to the bathroom. Please only park in Rancho Cañada del Oro paved parking lot if there is plenty of parking available. A overflow parking lot is available 1/4 mile past the paved parking lot on the left. Please park there and walk back to the Aid Station. Drive on Casa Loma Road approximately one mile. Turn left onto McKean Rd. Turn left into Calero Park returning to the Start/Finish location. Drop bags maybe left at the start/finish for the 50K. We will have two drop bag locations for runners: (a) The Start/Finish. (b) Aid Station located at the Rancho Cañada del Oro parking lot. 50K will be able to access their drop bags at the Start/Finish once. Results will be posted at the top after the race.